Alice is twenty-nine. She adores sleep, chocolate, and her ramshackle new house. She’s newly engaged to the wonderful Nick and is pregnant with her first baby. There’s just one problem. All of that was ten years ago . . .
Alice has slipped in a step-aerobics class, hit her head and lost a decade. Now she’s a grown-up, bossy mother of three in the middle of a nasty divorce and her beloved sister Elisabeth isn’t speaking to her. This is her life but not as she knows it. 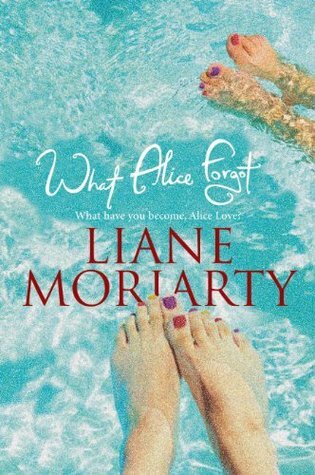 I’ve read all of Liane Moriarty’s novels and this is definitely one of my favorites. A bump on the head and suddenly ten years have passed… Alice can’t remember a thing. And it seems that a lot has gone wrong over the years as she finds out she’s not speaking to her sister AND she’s getting a divorce. I absolutely loved this novel and really want to read it again. I remember that I had to rush through the last quarter of the book as it was due back at the library. I remember finishing it in the car on the way to the library. We were going out of town and had to drop it off on the way. “What Alice Forgot” was a thought-provoking, unique, and hilarious read that I can’t wait to read again! When is she writing another book? Do you know? I love all her books, but this might be my favorite! I haven’t seen one come up yet but I hope she does soon!! Haha! Great reading story – since I work in a library, it’s nice to hear that people are serious about returning books on time. I also enjoyed this book – seeing your review makes me want to read it again! I loved this book too. And you are right, it’s definitely thought provoking. This was such a good book! I remember not being able to put it down.